Yes, I know, I’m posting a new release from Tuesday on Friday. So sue me. It’s been one of those weeks! 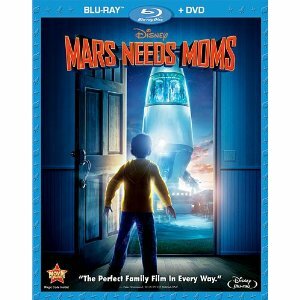 But I didn’t want to wait too much longer to write up this one: Mars Needs Moms released on DVD this past Tuesday. I actually went with the fam to see this in theater earlier this year! As you’ll see from my rec, be warned that there are some harrowing moments with the Mom (obviously all turns out okay in the end but the little guys may not know that!) but otherwise this is an entertaining movie for sure. There’s some fun Mom humor in it too so check it out. You can get the Blu-Ray pack (which includes a Blu-Ray disc and DVD) for $22.99 on Amazon with free shipping.